Every year in January I put up a survey on my blog asking what you’d all love to see more of on Sunny Side Up and guess what the number one thing is that I always hear back? A regular day! Never what I’m expecting to hear, but I get it! It’s always fun to see how other people live and how they fit in all that they do. So friends, this is it. 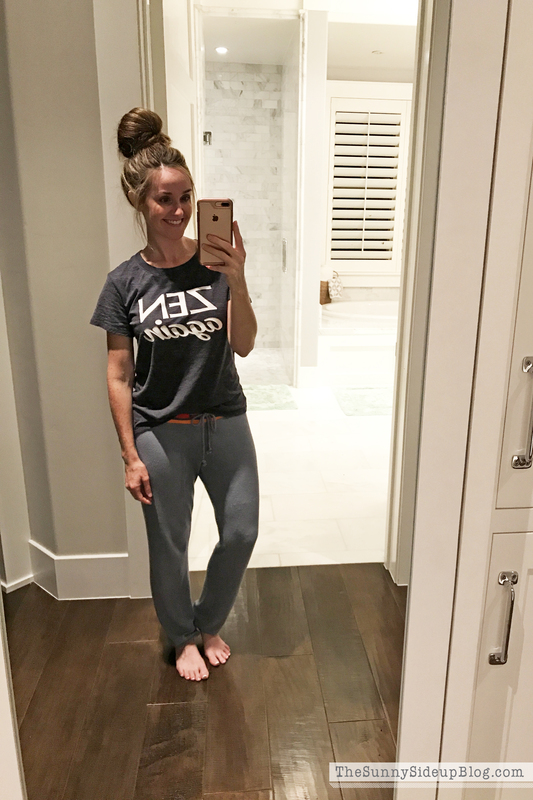 Today I’m sharing what a typical day in my life looks like. You can bet it will be beyond glamourous. 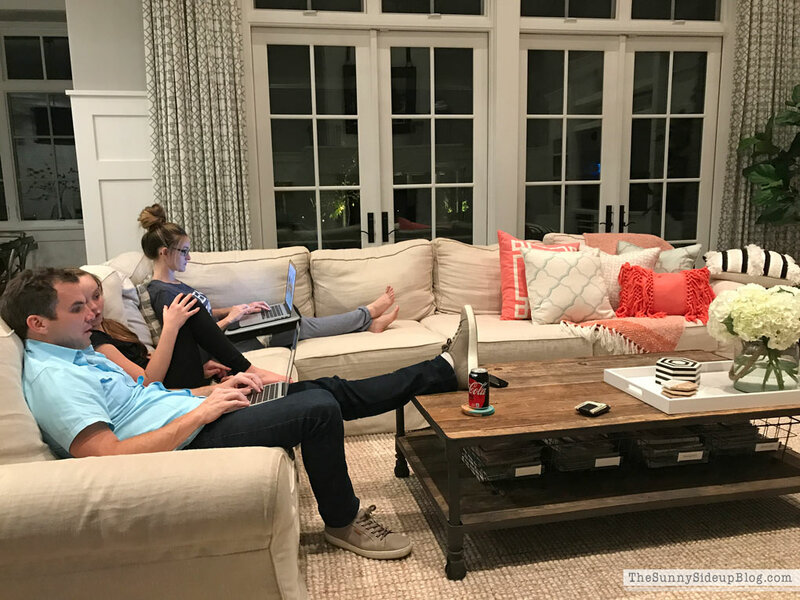 ;) I’m joining my friends Amy and Christy at Magnolia Lane and a group of fun bloggers in this series so there will be lots of fun “day in the life” posts to check out! It’s always the best to get ideas and learn from each other. I picked a day last week and documented the whole thing from start to finish. I used my cell phone for a lot of the pics during all times of the day (not just good lighting times) so this truly is real life in all of it’s grainy glory. Grab a snack! My days are long. ;) Here we go! 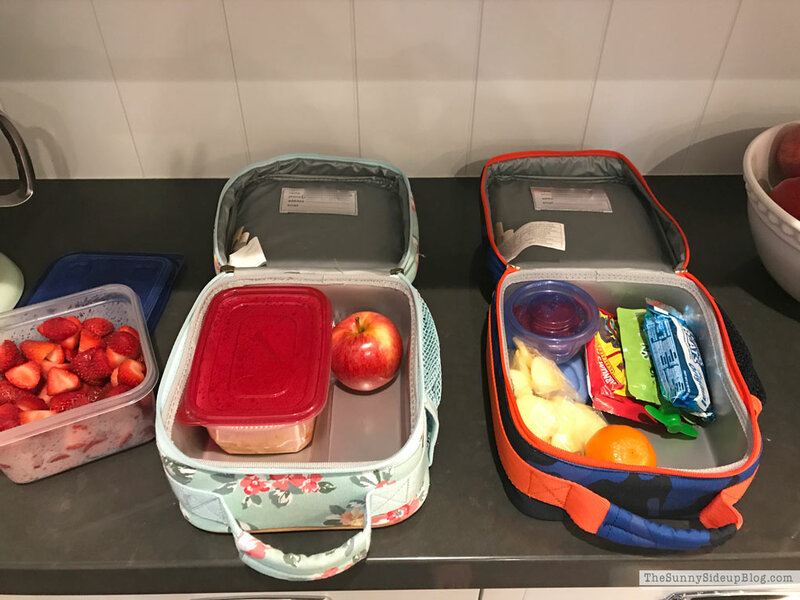 Once my girls are both up and going I go back to my bedroom to put on my workout clothes and then I head to the kitchen to start making breakfast and packing lunches. 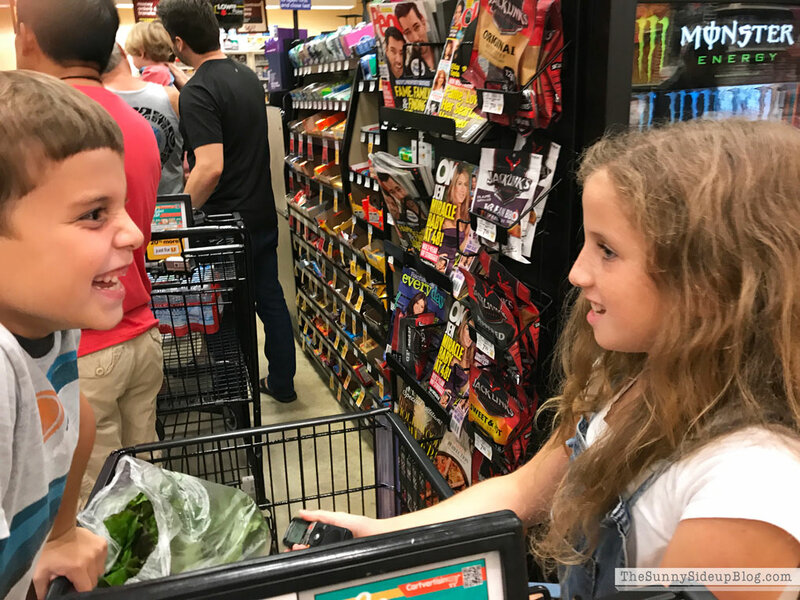 El gets lunch at her school, but Ad and Kole still like to take a lunch despite my on-going efforts to convince them that school lunch is amazing and lunch from home is of the devil. Lunch packing. I am not a fan. 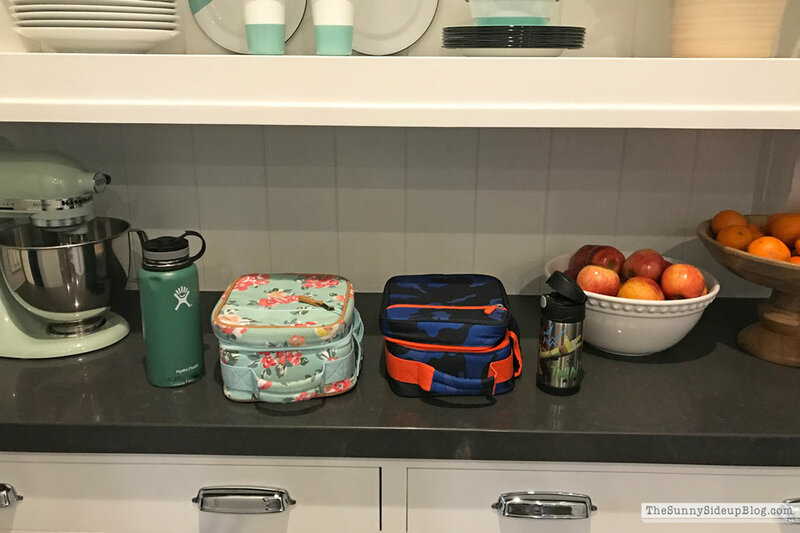 I always have the kids set their lunch boxes and water bottles out on this counter the night before so I’m not searching for them the next morning and sometimes (if I’m on my A game) they get the packing started the night before with things that won’t go bad. Then in the morning I finish them. 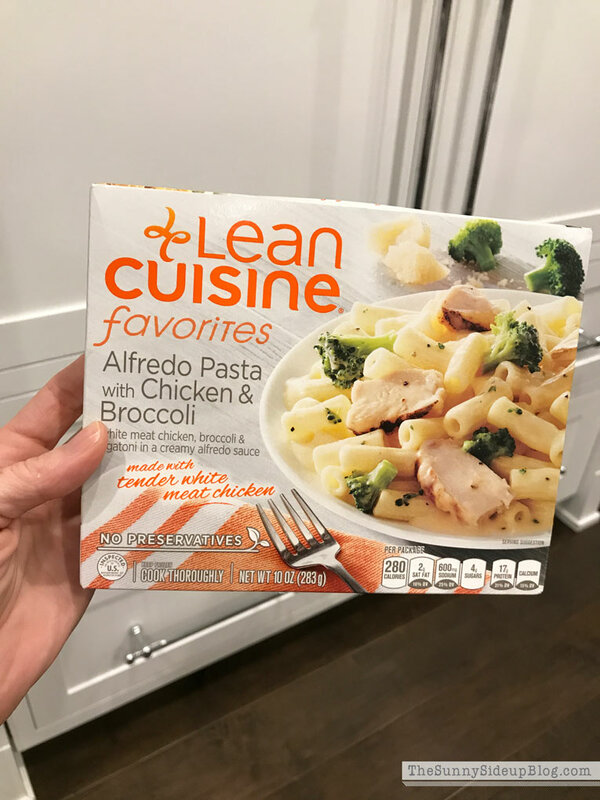 I’m struggling this morning because Kole doesn’t want the leftover pasta I was planning on using so his lunch is looking rather pathetic with a cutie orange and animal crackers as the main dish, but it is what it is at this point! We need groceries. Kole usually wakes up on his own at some point while I’m making the food and then the girls and Kenny come in the kitchen and everyone (except me) eats breakfast. Then I help the girls round up their things and get out the door by 7:20. Most mornings (if my husband doesn’t have an early meeting) he takes the girls to their middle school on his way to work. Last school year Kole’s school started at 8:00 so I went to an 8:15 class at Orange Theory after I dropped him off. (Do any of you workout at an OT? Crazy good workout!). But this year Kole is at a new school that starts at 8:30 so I can’t go to my class. 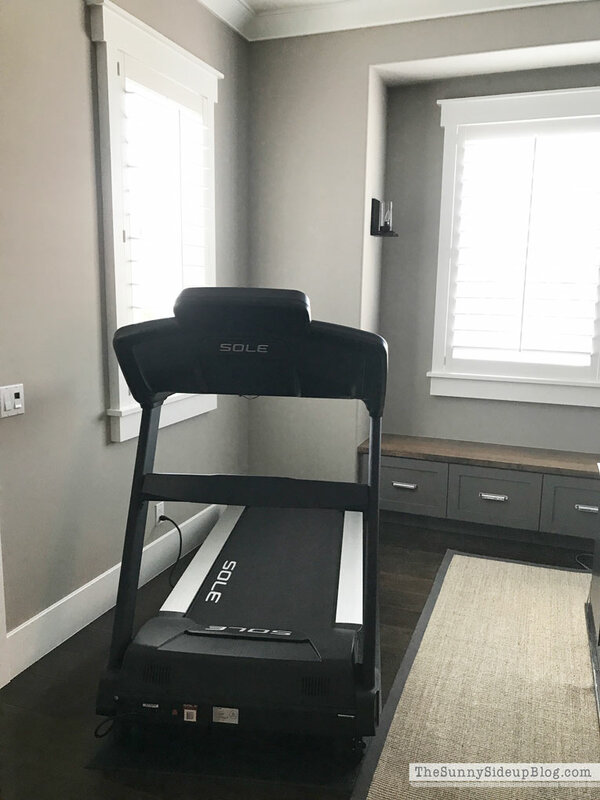 I don’t want to take the 9:20 class because I have too much to get done during my kids’ school hours and can’t have exercise take up the whole morning, so over the summer we bought a new treadmill and my plan is to do a quick 30 minutes on it before I take Kole to school. I still may do an OT class once a week and I usually run with friends one morning a week, but this will be a quick something for most busy days. I’ve been decorating Kenny’s office and it was looking so good until I plopped a huge treadmill in there.. ha! Not my best decor accessory. ;) But it works! And he could care less. After I exercise I finish helping Kole get ready and off to school we go! 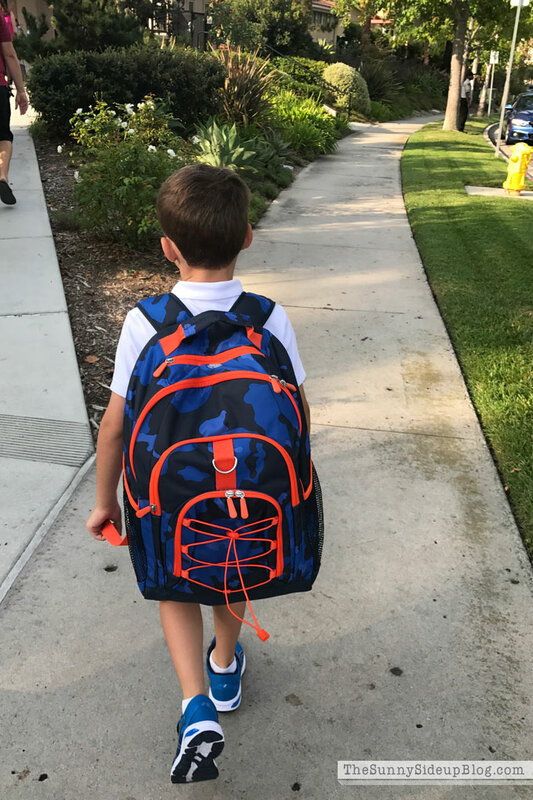 He has to wear a uniform this year – little polo shirts and tan shorts that he’s not a fan of, but I help him accessorize with fun shoes/backpack so we make it work. ;) I chat with moms/friends at his school after walking him in and then head back home. 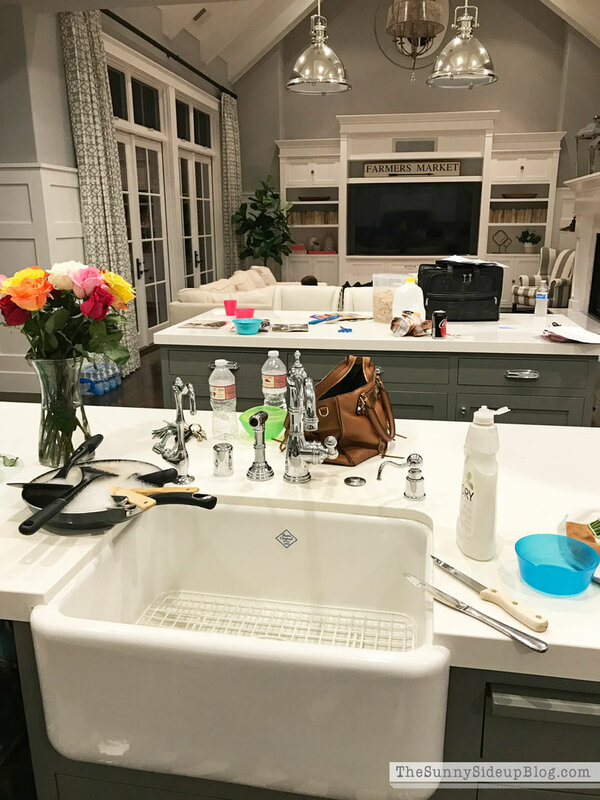 This is the morning rush kitchen mess that is always waiting for me and even though I need to shower and have tons of work to do, I can’t do anything until I’ve cleaned my kitchen! I put an egg on the stove and while it’s boiling I start cleaning. I know – one boiled egg is a lame breakfast! But I am never hungry in the mornings and would love to just skip breakfast all together if it weren’t for the whole “you have to eat breakfast.. it’s the most important meal of the day”.. spill. So I make myself eat an egg and call it good. I get the kitchen looking like this again. Ahhh. Much better! 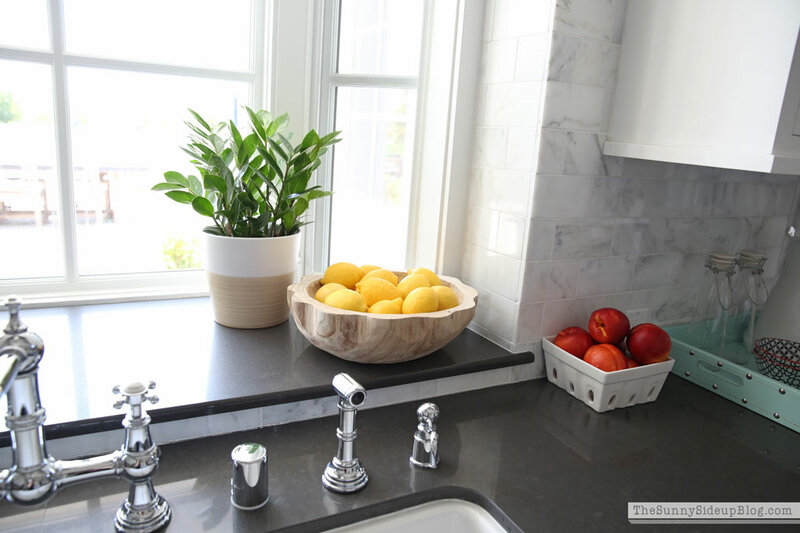 I add some lemons to a wooden bowl and a new plant. Then I take this pic to share on Instagram at some point. Kitchen is clean so I head to my bathroom to get ready for the day. 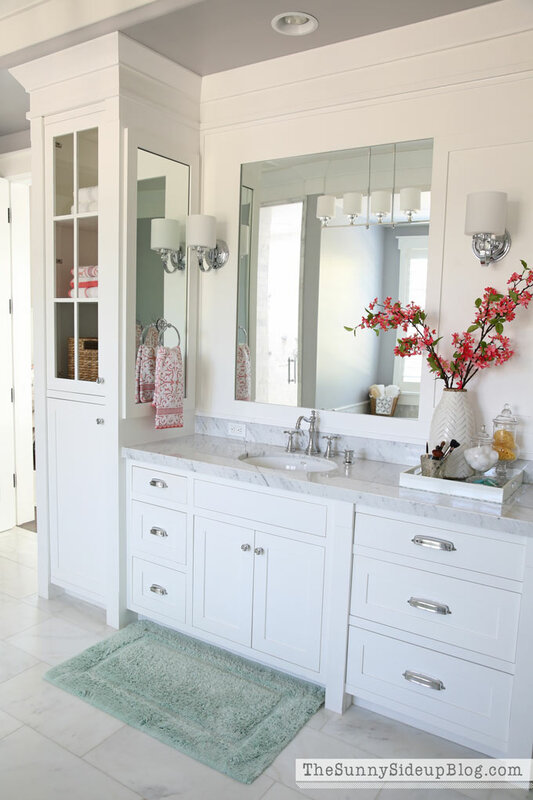 My bathroom wasn’t quite this clean but I forgot to take a pic of it. 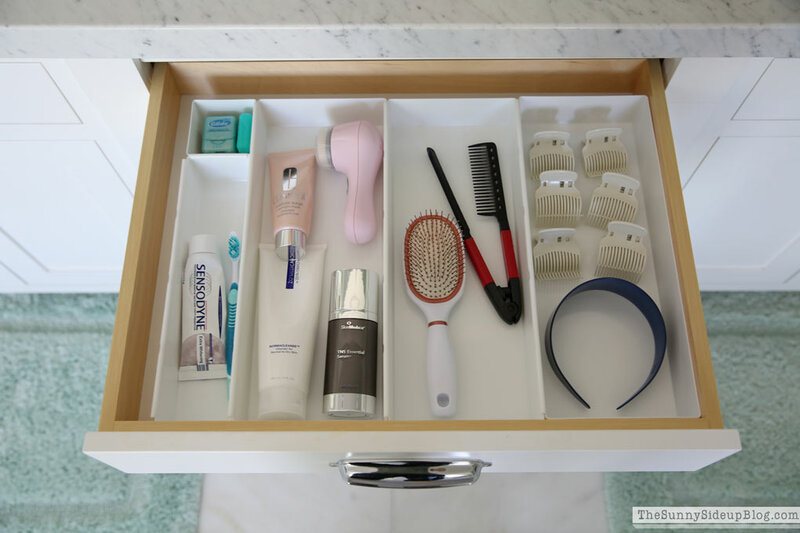 Although I will say that ever since I organized my bathroom drawers I have been doing a pretty good job putting things away immediately and keeping it clean! Definite improvement. :) I shower fast (and don’t wash my hair) and get ready. Then it’s time to get to work! During the day I work at this window desk in my office/craft room. 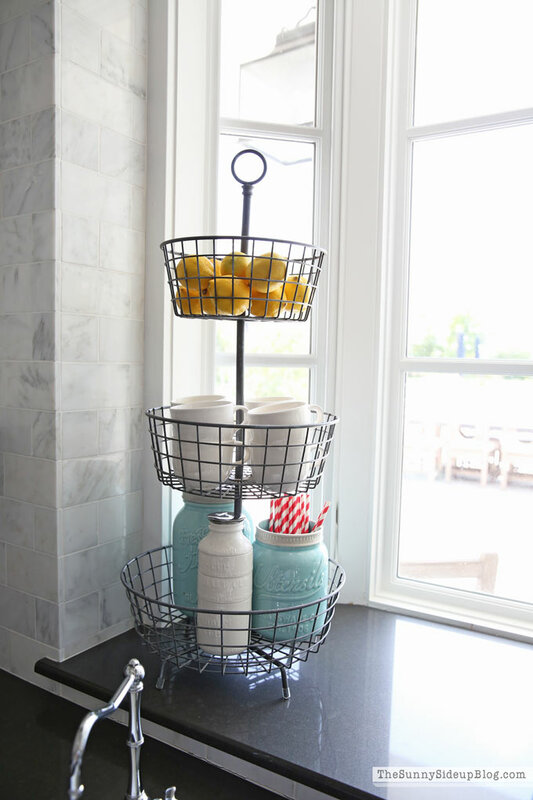 Lots of fun things help me stay organized! 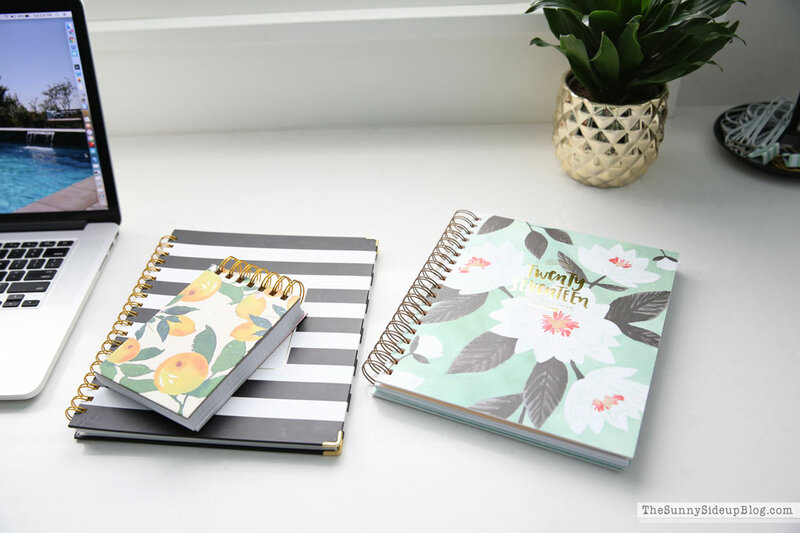 I have multiple planners – which aren’t necessary but I’m a planner/notebook addict so there’s that. :) In one of them I have my blog content planned out for a month. I always get side tracked and never follow it exactly, but it’s a good outline to go by. 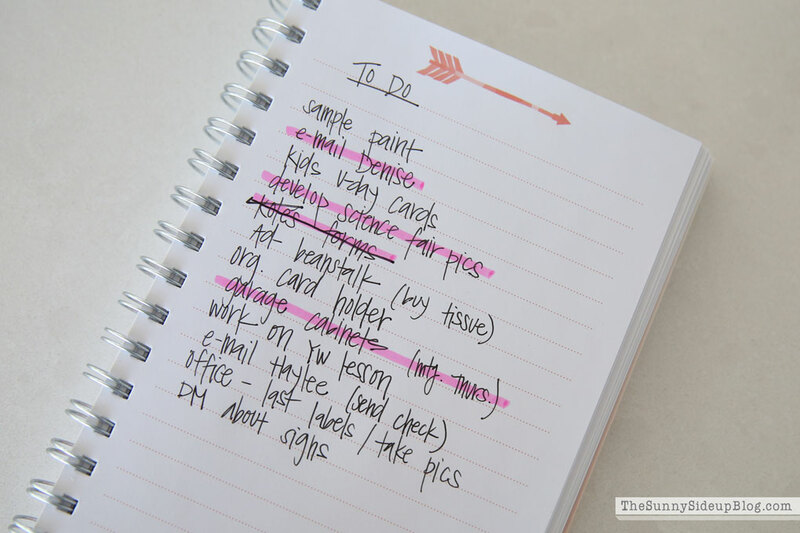 This is an older to-do list, but using it just to show you – I always have a running to-do list going (one for my blog and one for every day life) and then I highlight the top three things for each day. When they are done, I highlight three more and just keep going! I also have a Visual to-do list in my office that I refer to for larger projects I’m working on. You can read more about that here. 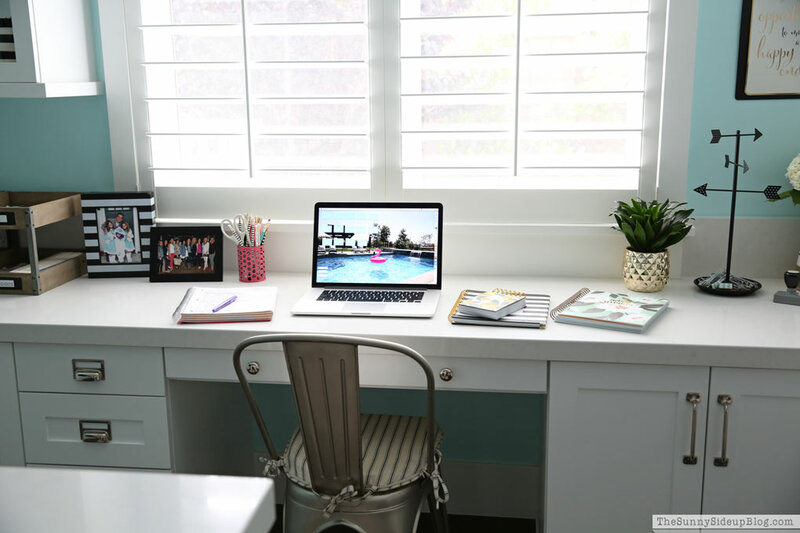 I have more desk organization coming in a post soon because this post is already too long! At my desk I answer e-mails, make phone calls for the upcoming party and appointments for the kids I need to schedule, answer blog comments, etc. I am giving a fun gift to a friend at the party that involves everyone sending me e-mails so I spend some time working on that too. 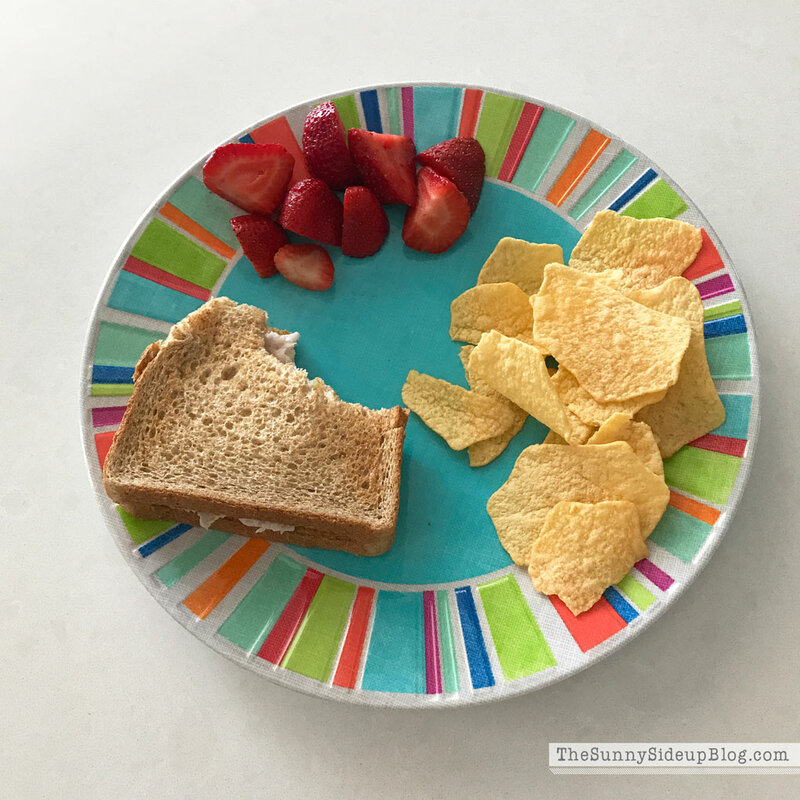 Time for lunch so I make me a quick turkey sandwich with baked lays and strawberries. Typical lunch I’ve been eating for years! 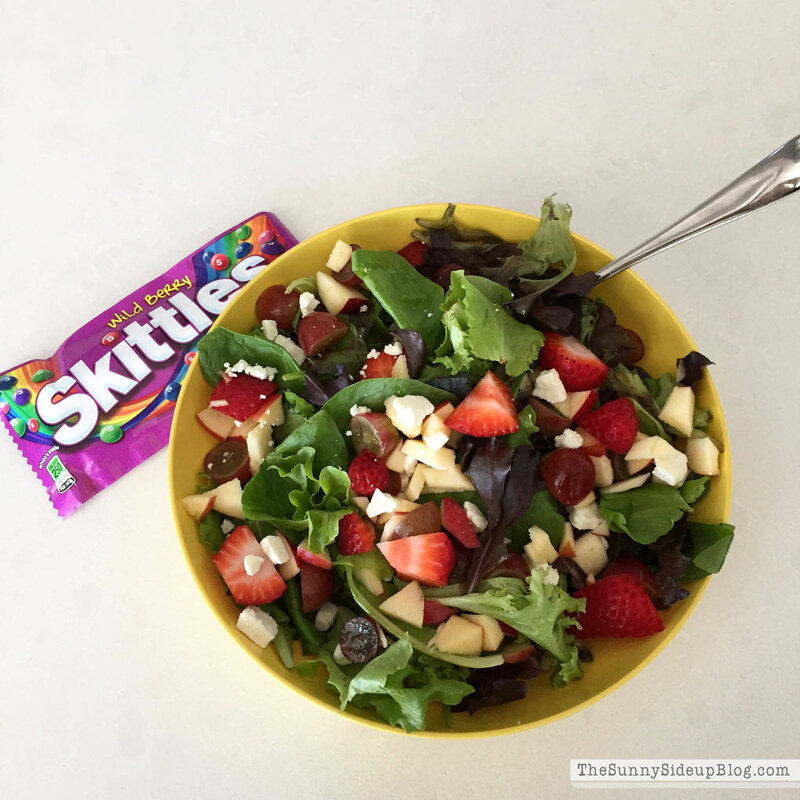 Once in a while I mix it up and make me a salad instead of my turkey sandwich. And then I always add some sort of candy or treat after. Because I wouldn’t want to be too healthy. ;) I usually take my lunch back in my office and eat while I keep working. Then at 2:00 I have the countertop guys scheduled to come and install the counter in our theatre room. 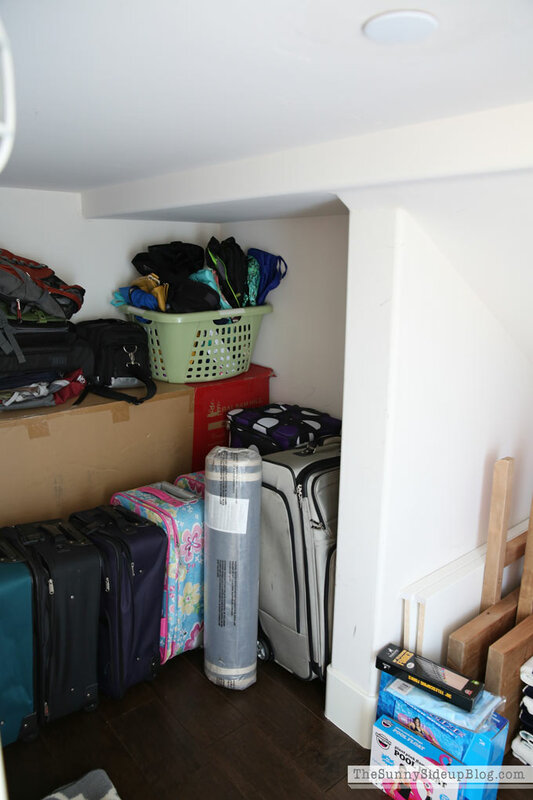 (Progress on that space coming too!) I meet with them and get them started and end up staying upstairs with them to show them where to drill holes for the faucet, sprayer, etc. At 2:45 they are still working but I have to leave them to finish while I run to pick up my kids from school. My work day is over so anything I didn’t finish will be put off until late! 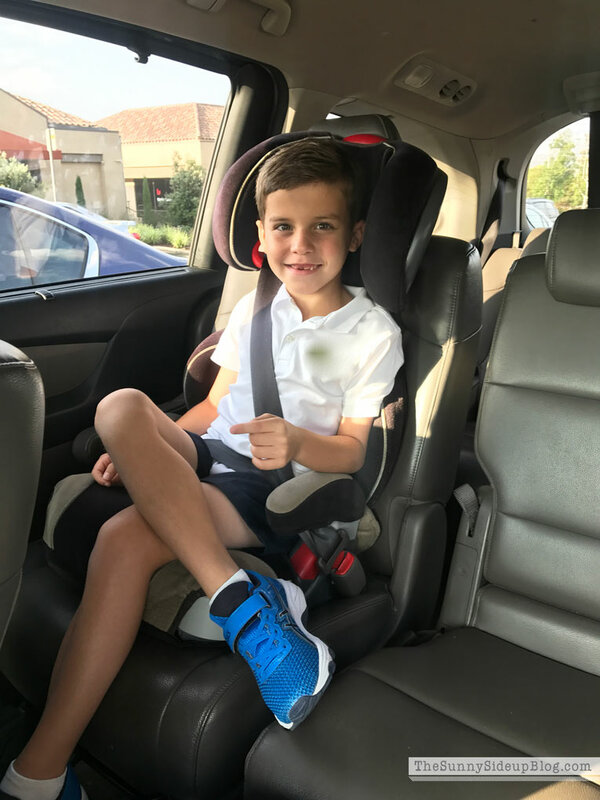 I pick up this cute boy and hear all about a fun Science gummy bear experiment he did in class and how they also read his favorite story Teacher from the Black Lagoon and how his new school is the best school ever (yea! #momwin) and can he please have some food immediately because his lunch didn’t fill him up (sigh #momfail). We head to the girls’ school to pick them up. I quickly answer IG questions while I’m waiting in the carpool lane. Then when the girls come I drive straight to Addison’s play practice. She finished Alice in Wonderland on a Sunday and started a new play on Monday! 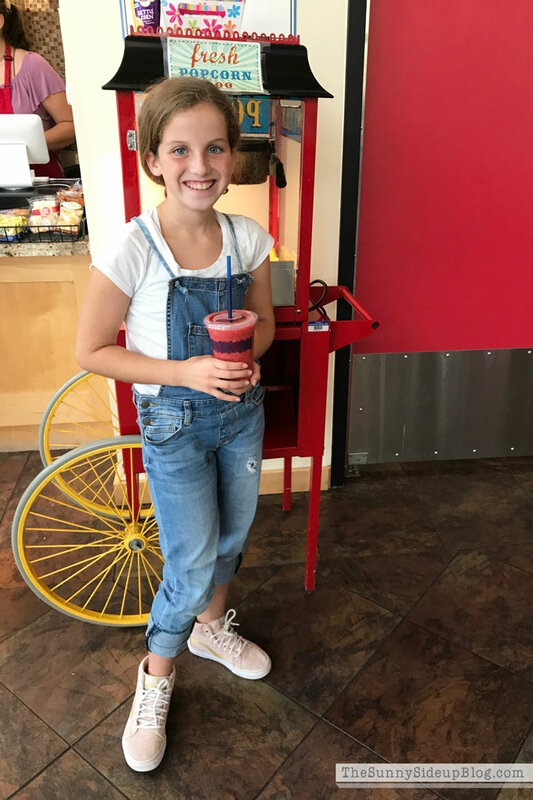 I leave Kole with Ellie and take Ad in the building she has practice (that also conveniently has a little food shop) and buy her a smoothie for a snack because she won’t be home until 7:00. She meets some friends that are also in this play and I snap a picture and give her a hug good-bye. They have 10 minutes to eat before practice starts! I get in the car and El and Kole beg me to get them pancakes at our favorite bakery. 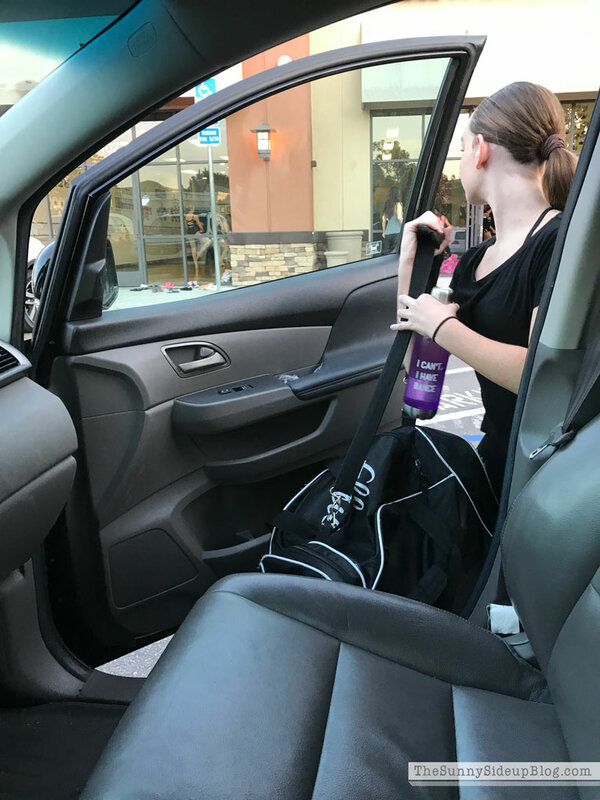 We usually have to rush home for El to do homework before dance, but she assures me she finished most of it during ISPE (she gets a study period at school instead of taking PE because of all the dance she does outside of school – love that!). Plus she only has 2 hours of dance tonight instead of her usual 3-4 hours so pancakes it is! I never order me anything because there is always left overs. :) We have a good chat and I hear all about Ellie’s day at school. She is keeping the middle school drama at bay and I’m proud of her. While El and Kole are doing a word search I hurry and post something on Instagram. We walk into the house and El heads to her room. Kole changes out of his school clothes immediately – ha! Then he needs a little down time to play so I find myself with 30 minutes before I have to leave again to take El to dance. 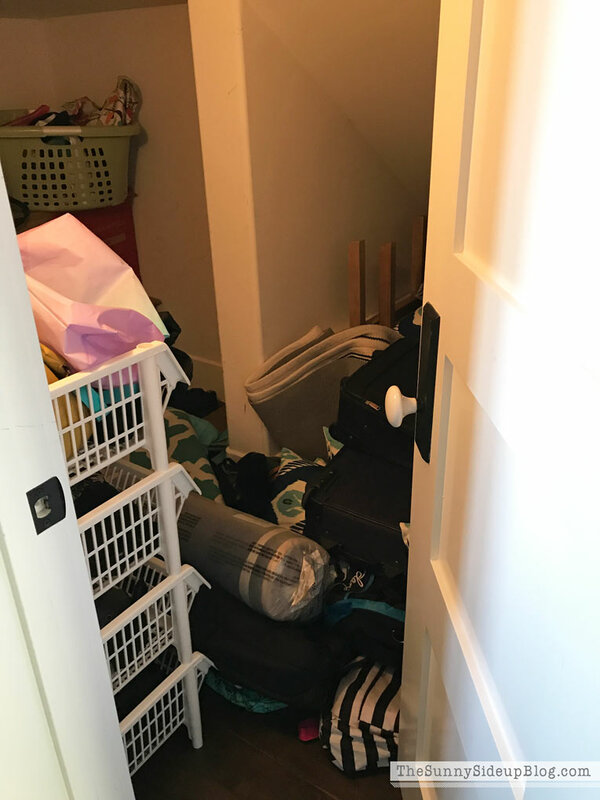 Kids are fed and happy and I have just enough time to fix this mudroom closet that has been driving me crazy! We let it get messy over the summer and I could barely open the door. I quickly pull everything out, decide I don’t want to use the stacked organizer on the side anymore because it’s taking up too much room, re-organize everything, and put it all back nice and neat. I start a load of wash downstairs and run upstairs to check on El and see if she’s ready for dance. Then I start a load of towels in the kids’ laundry room before we head out the door. You can see he was thrilled about that decision. 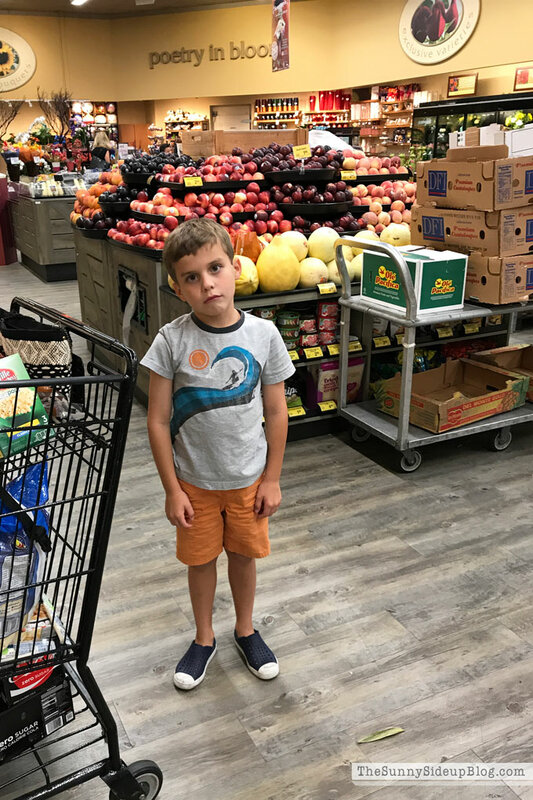 This kid just loves to go grocery shopping. Luckily his sister keeps him entertained and cheered him right up! I head upstairs to get Kole in bed and toss the towels in the dryer. The roses were a fun surprise left from a friend. I start picking up and realize that it’s 9:00 and I haven’t eaten dinner and am hungry. I forget my own dinner a lot because we are so busy in the evenings so then I start eating/snacking too late. It’s a problem! While my dinner is “cooking” in the microwave I clean the kitchen and load the dishes. Again. I kiss Addison and get her up to bed and then eat dinner. Then I head to my bathroom to take out my contacts because my eyes are hurting. I always take off my make-up at this time of night because I stay up late and am too tired when I finally make it to bed. Kenny walks in the door with Ellie (thank goodness he always does the super late pick ups!). She wants something to eat and I want to cry because the kitchen is finally clean. But I make her some food anyway and we talk about dance. Then at 6:20 am the alarm goes off and we do it all over again! We are in a busy stage right now with our kids and our jobs and a lot of days I am just doing the best I can to keep my head above water! But we are happy and our kids are healthy and doing great. We have a wonderful life that I’m very grateful for and I wouldn’t change a thing. Except maybe hire someone to make the school lunches. I’d change that little routine if I could. Busy day, girl! But I loved hearing about it. 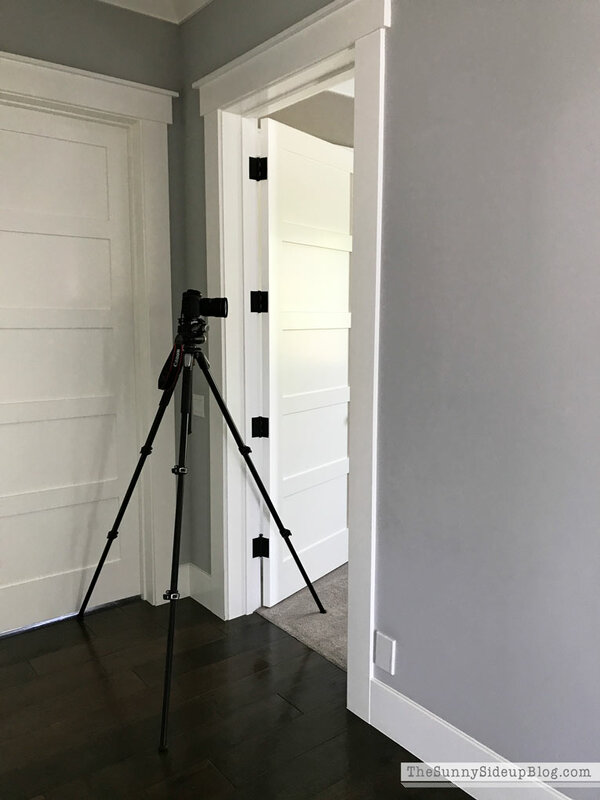 Looking forward to seeing your guest room! Oh my gosh, I LOVE this post! I really enjoyed reading about and seeing one of your typical days, start to finish. You have me exhausted just reading about it, LOL. Thank you for sharing!! 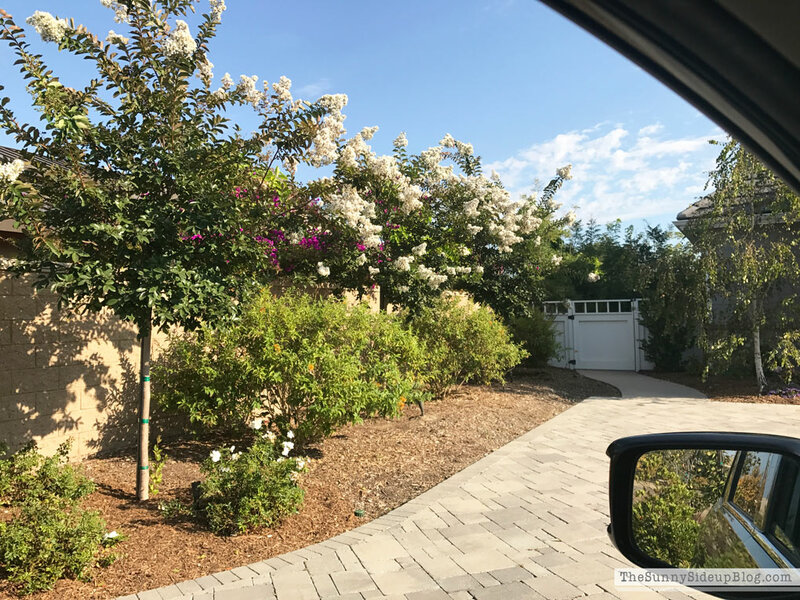 Love this peek into your life – thanks for sharing! I love this post! 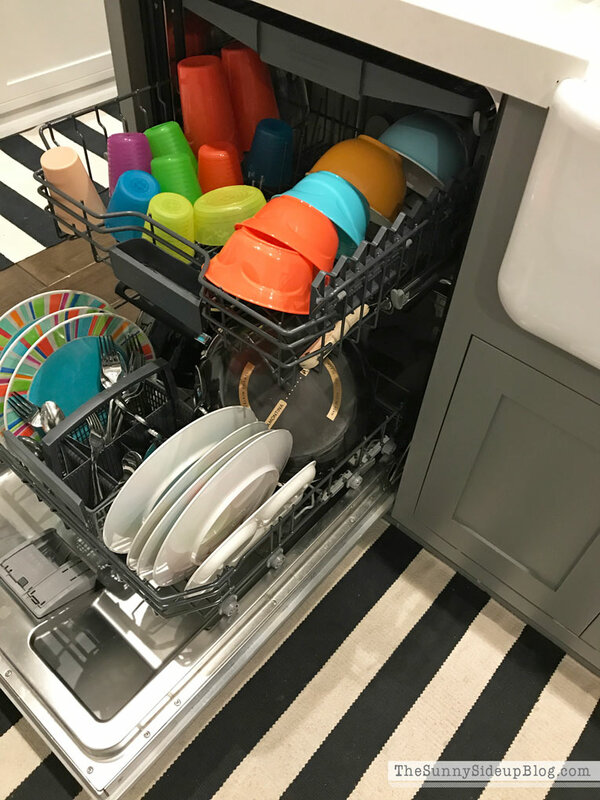 I would love to see more posts like this just documenting your day because it’s fun to see how you fit everything in! 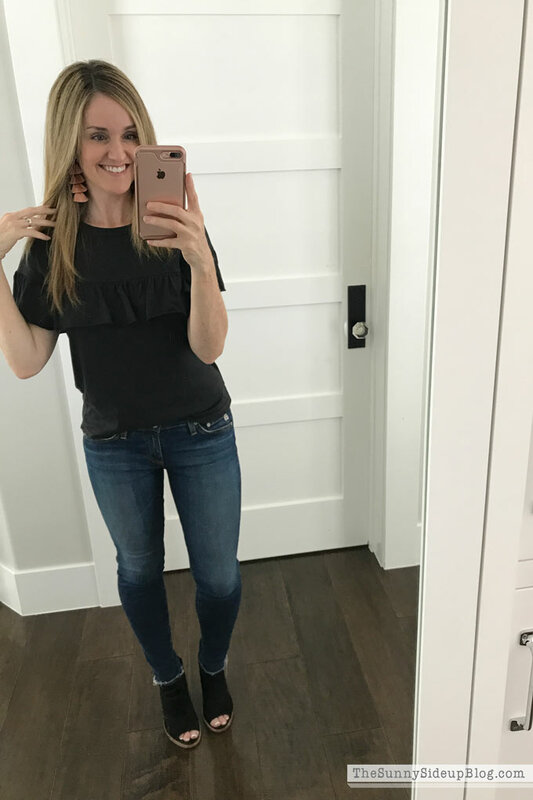 Erin–you are one busy lady! It does get a bit better as they get older. My son started driving this year and that has been a game-changer for me. He handles the late-night dance pickups (score!). My daughter has the same water bottle (Covet Dance, I think?) and yes, that saying is so true, especially as Nutcracker season has started. I sure wish she could get a study hall instead of PE; that idea makes too much sense! You might be juggling, but you do it beautifully. Thanks so much for sharing your day with us! Well this explains a lot…like how you stay so perfectly thin and beautiful at all times. You ate like 500 calories! Love you Erin! You’re amazing. Erin! I absolutely loved this! What a great post! You look adorable in a top knot, and we are total night owl twinsies! My hub does the same thing- sleeps on the couch next to me and I wake him up when I’m ready for bed! Love you, friend! Can’t wait to see you soon! This was seriously one of my all time favorite posts…lol.. why do we love to know what others do in their days! Haha. I think it’s always so interesting. I’m am so tired after reading that!!! Oh Erin, that use to be my life. School, dance, baseball! I miss it. You would think I could slow down now. That’s just not my reality. Like you, I get my second wind around 9:00 and I get a lot done between 9-12. As far as dinner goes. I’m not a foodie either. I’m happy with a bowl of cereal and strawberries on some nights. Your great mom Erin. It’s the best job in the world.! OMG you are awesome!!! 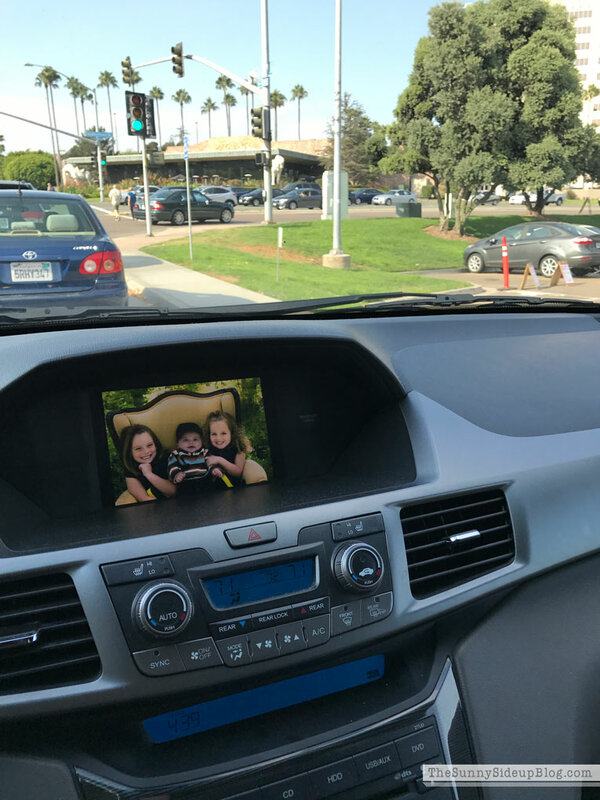 I’m tired just reading about your day, but it’s what us mommies do for our babies (I have two, who are both is several activities as well, and I can’t believe how much time I spend in my car.). 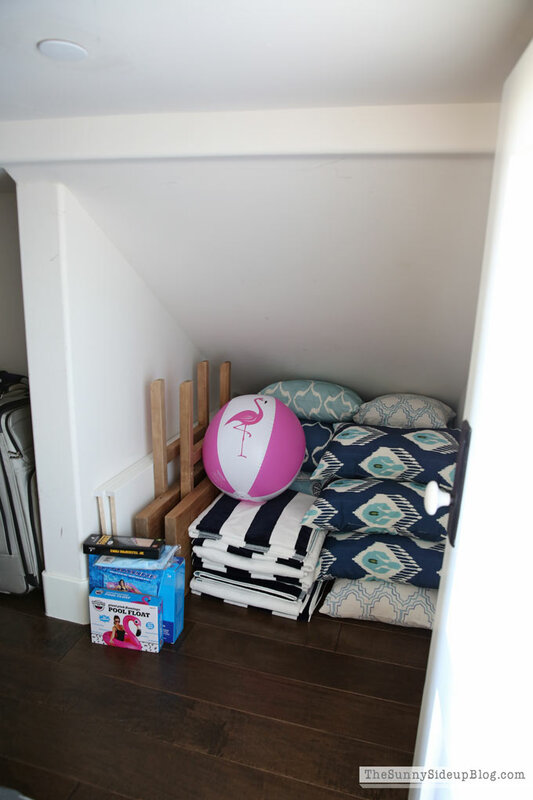 Btw if you are ever in the mood to change out your pillows and are going to get rid of the extra pillows in that mud room closet please let me know. I would love to take them off your hands 😉👍☺️ Thanks for sharing a bit of your life with us. 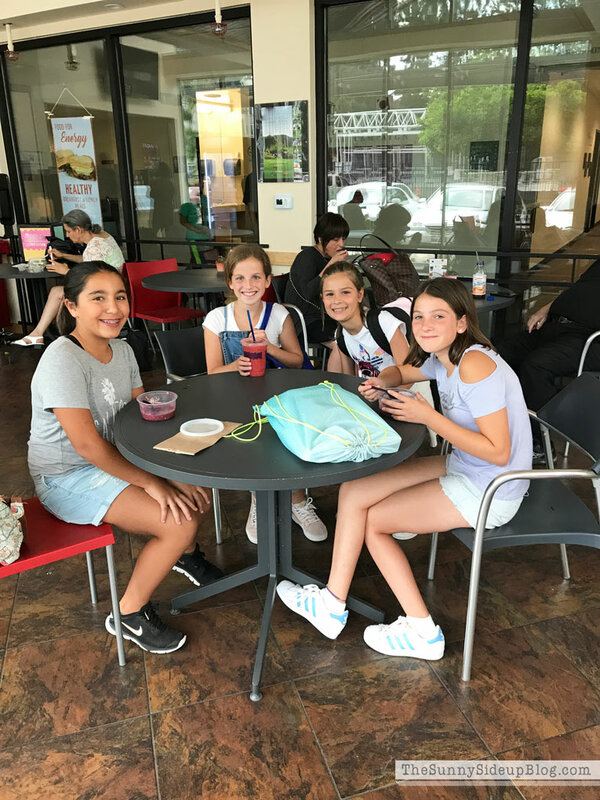 I have a question – does Ellie take supper with her to dance? Or eat afterwards? My life seems to revolve around food – my family all has to eat at least 3 meals a day. My twins eat more, it feels like all the time! Wow, Erin! You pack a lot into your days! I knew you did because that’s what moms do, but whew! That is a lot. :) And very familiar. It’s definitely a busy season of life for sure. 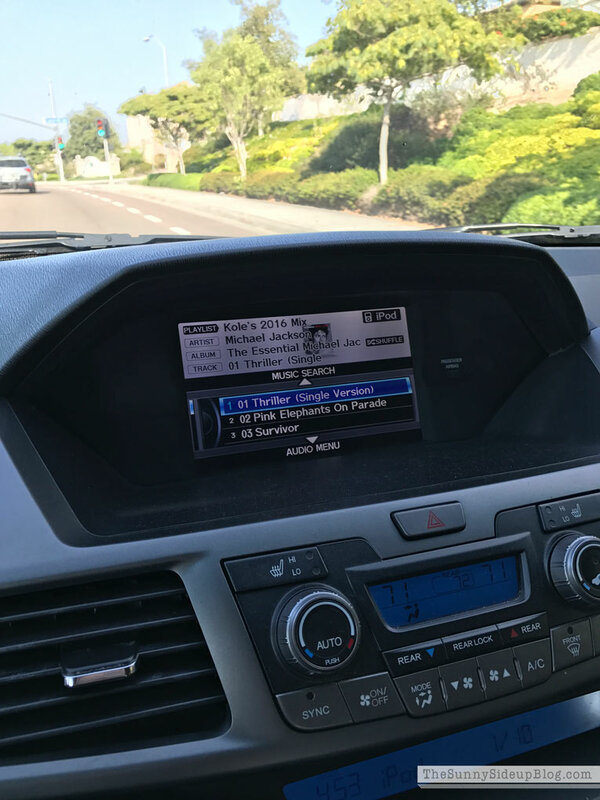 I thought I was busy driving, but you sure have the edge there. LOL Thank you so much for taking the time to share your day. It was really fun to read. You are a cutie and I enjoyed seeing you all casual, too. I hear you on the math work. That’s on my hubby, too. That was a super cute picture in the van. But, oh honey, I’d be jumping at the chance for a new vehicle! I am so ready to give up my van! :) Hope you are getting into a good school routine. Ours is going pretty well. But I had an extra day off from work on Tuesday and it made me miss the days when I didn’t work at a paying job. LOL Hope you have a good rest of your week! Thanks again! Hugs! Hello! 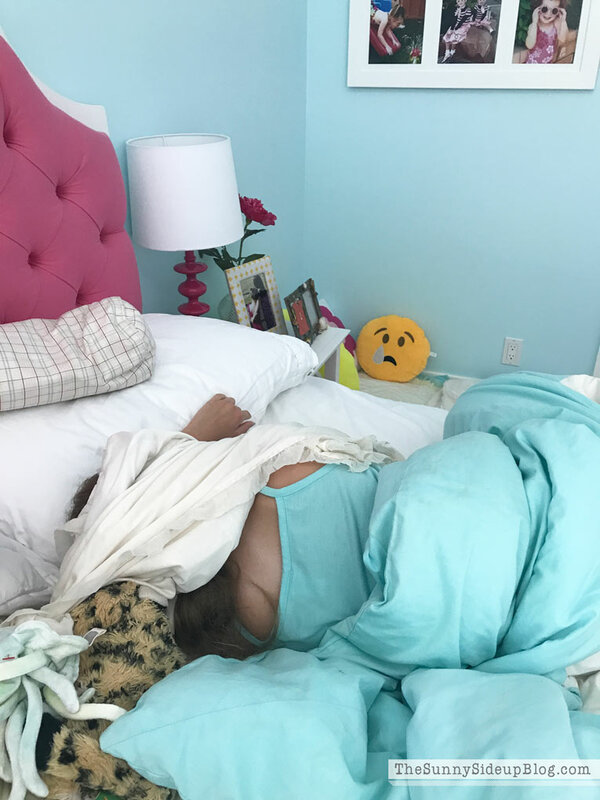 I love reading your posts because I’m not a very organized person but also hate clutter… I have 3 kids also, 6,7,and 9 yrs and I am a taxi service in the evenings 5 days a week like yourself and love every minute of it. Some of your routine has inspired me to change a few things about my day so this has been really helpful. I have one big question though…. WHERE is your COFFEE or fuel??? I’m so jealous if you can get by without it. I only have one in the morning but it’s my favorite part of the morning and I look forward to it. I swear chauffeuring (is that a word) kids around is a full time job. A night off is like Christmas. LOVED this post Erin! You just proved you are for real and doing what a momma does best :) I’m right there with you on the schedule. Life is BUSY!!! You are doing an awesome job and I just love your family! :) And I totally agree with you on the lunch packing – the WORST! :) Have a super day! Phew !!! You are super busy ! 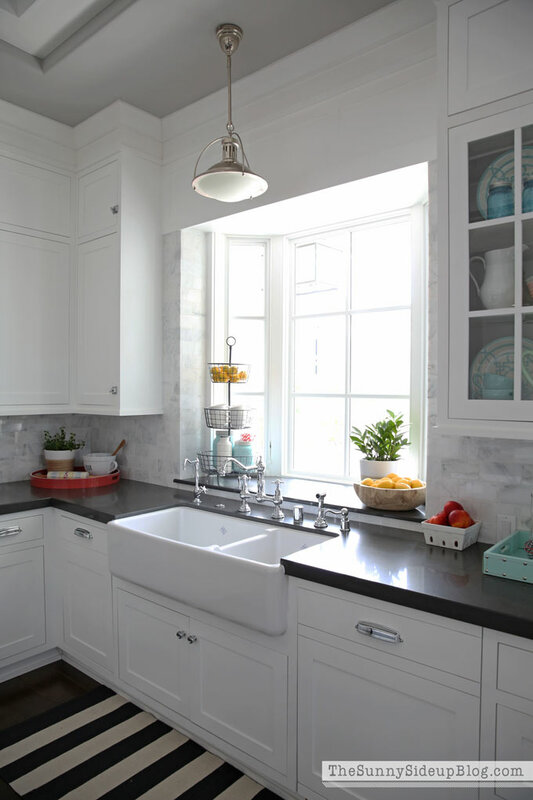 What are all those taps for at your beautiful kitchen sink ? Enjoyed the post- thanks for sharing! Oh my gosh! 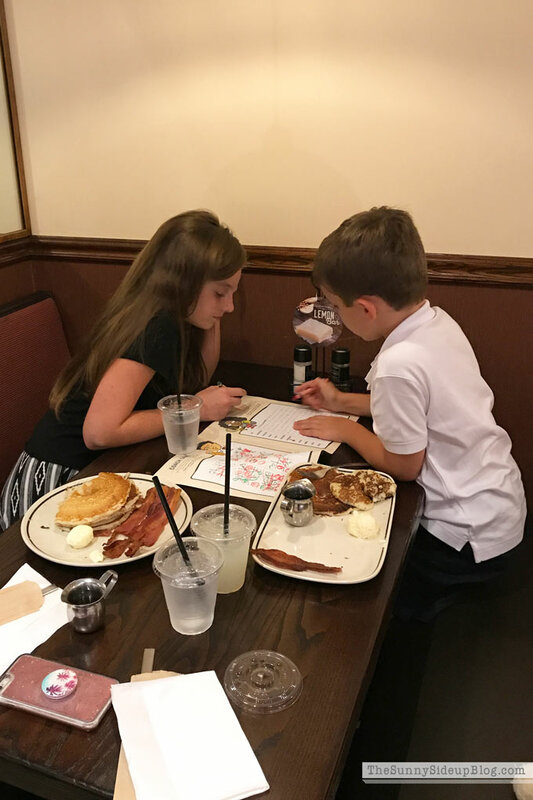 What a busy busy day – but so sweet and fun! You are just a total doll – beautiful in and out. Loved reading this, sweet friend!! Whew!! It wore me out reading about how busy you were all day!! haha! 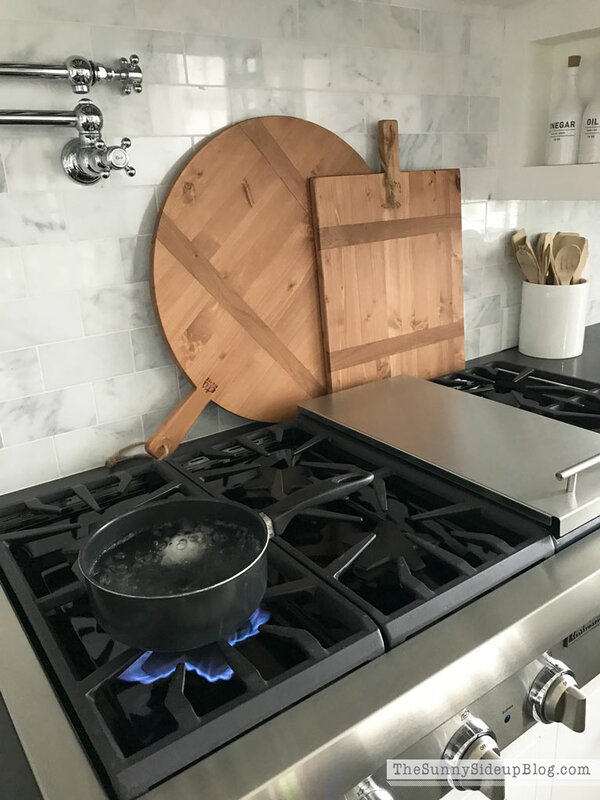 This is one of my all-time favorite posts of yours – we got to see the real-life Erin in action! Wonder Woman!! You have such a busy life with so much going on. 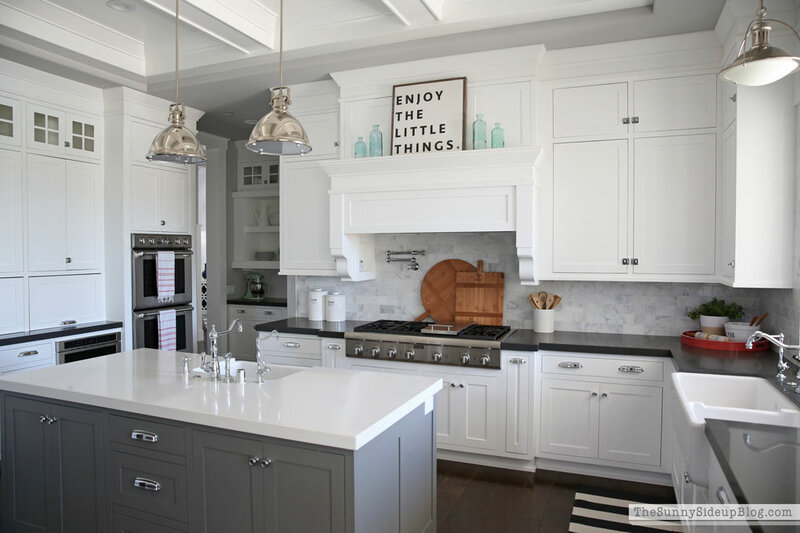 I admire how you organize your TIME, as well as your home! 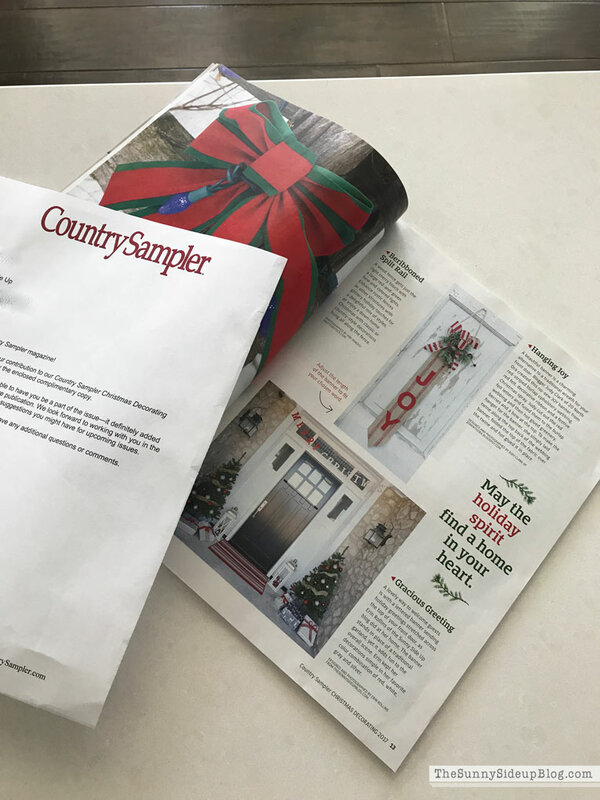 Congratulations on your front door / porch being featured in the magazine! 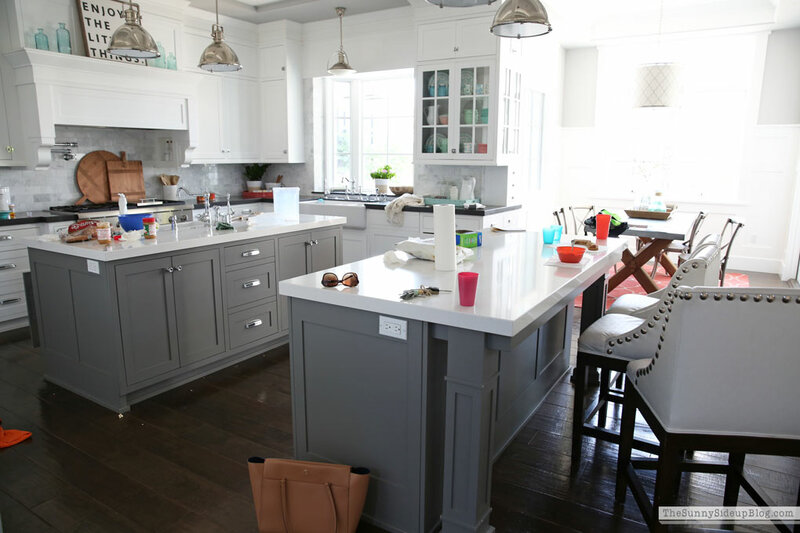 I can’t wait to see your kitchen featured in BHG! 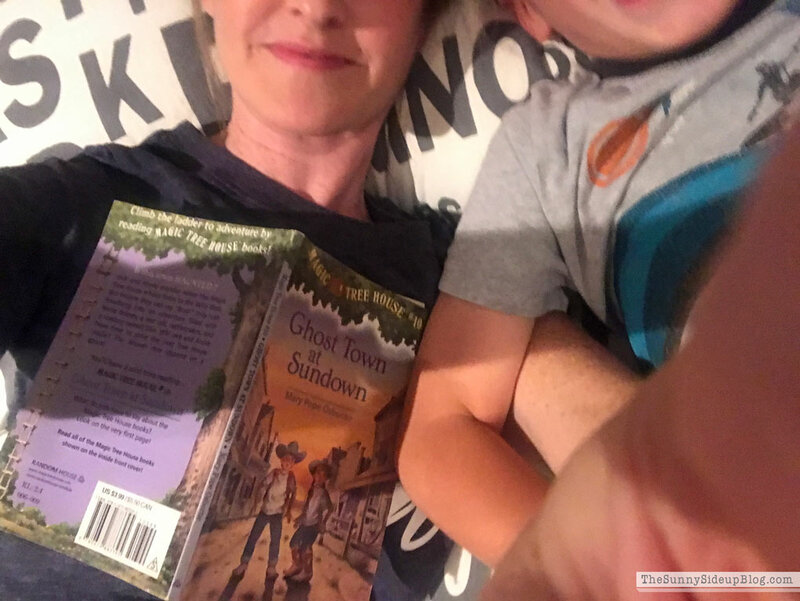 Thank you again for sharing your lovely family with your readers!! Such a great post!! I absolutely love the “Day in the Life concept! Loved the day in the life post!! PHEW I was tired at the end of it! 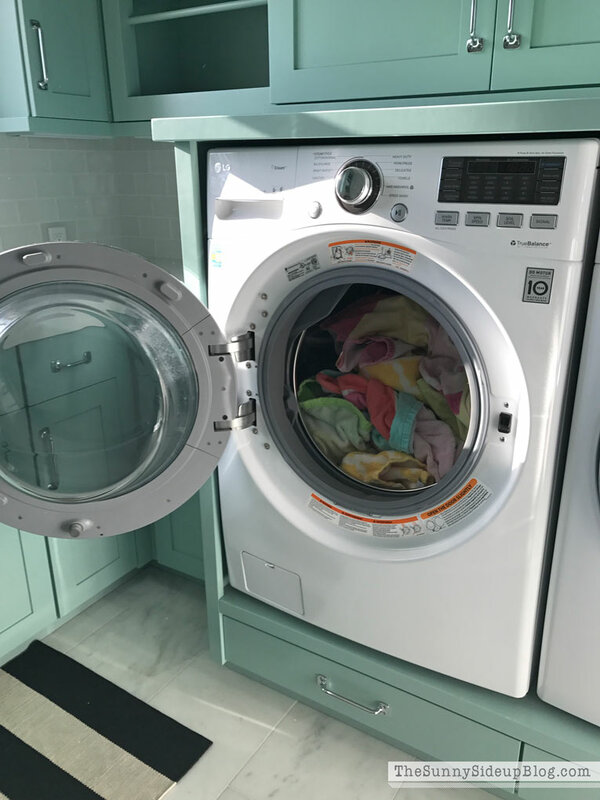 LOL Quick question — I noticed that you have the same washing machine that I just got about 3 weeks ago. 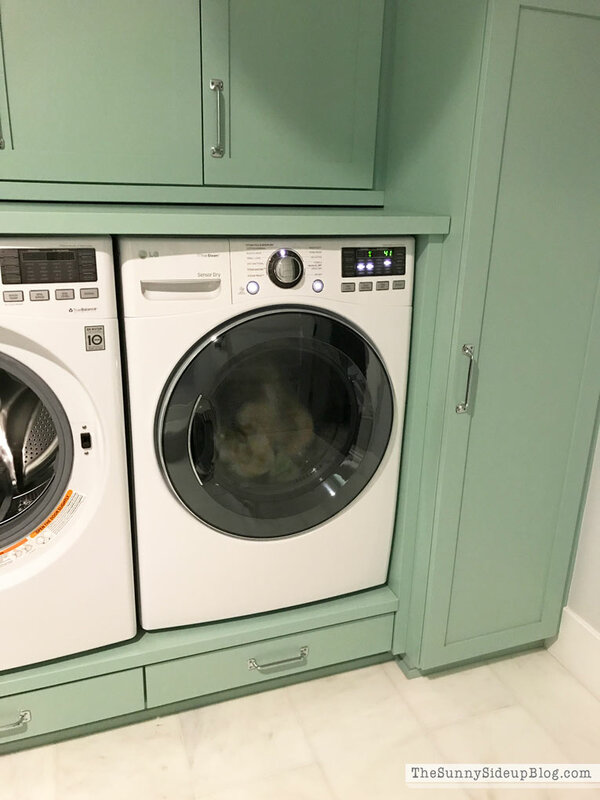 Do you ever hear it make a ‘thumping’ sound and the door shakes when its doing the rinse cycle? I don’t know if it’s normal and just trying to adjust the clothes so they are not out of balance or what. I am terrified the door is going to pop open LOL! Anyway thanks for sharing your day! You are busy. 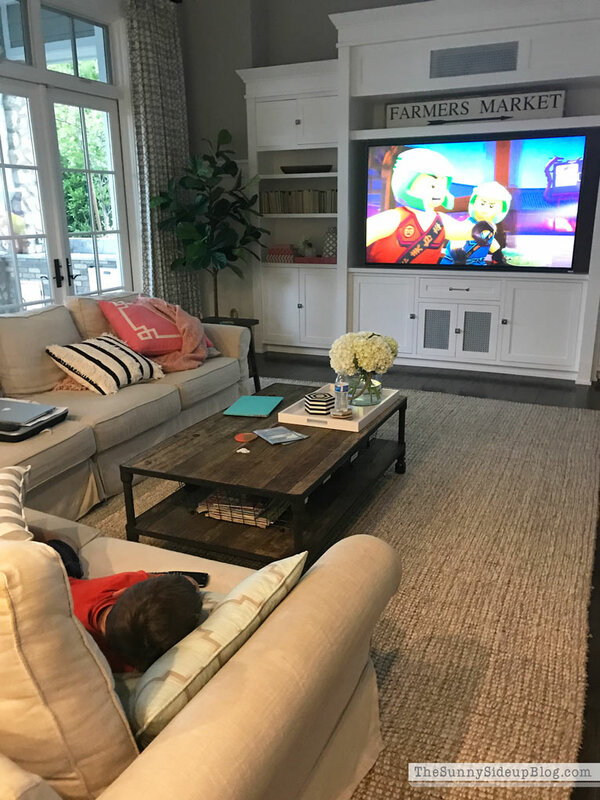 I used to be a teacher but now that I stay home with my boys, 5 and 1, and I feel busier than ever. I also think I put pressure on myself to get more stuff done. Since my husband works from home or travels he sees how I never stop. At least he appreciates everything I do and on those rare days when I need to crash during nap time, he encourages it. He actually encourages me to rest more but I love to cook and that’s my dinner prep and cleaning time. I’m exhausted just reading this. Lol. I can’t believe I used to do this with my two (bball, cheerleading, clarinet lessons, ballet, scouts, etc..). I just remember that sweet kiss from my husband when he walked in from work. The best part of my day. What a great post! I was exhausted simply reading about your day! You sure do pack in a lot and seem to do it with a smile. Thank you for sharing. I always look forward to your posts. 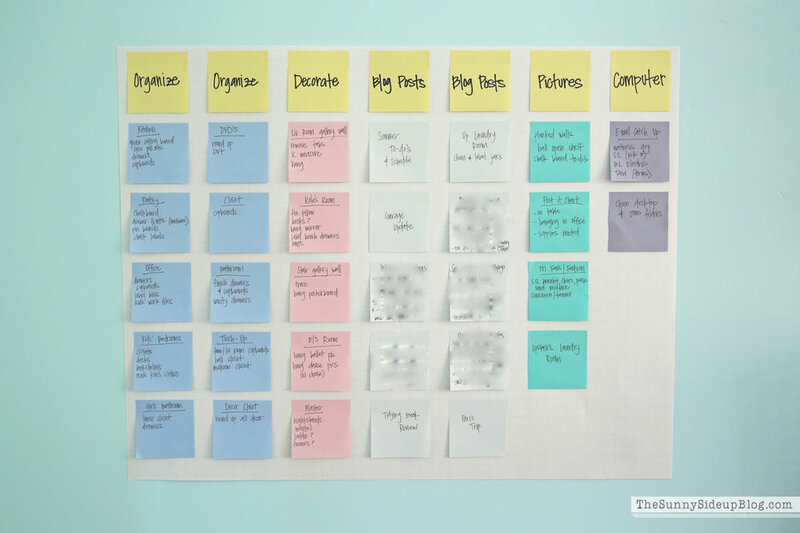 Girl, that visual to-do list board is just brilliance! I am so going to do that. I have to see things and love that it is big. Can’t wait to see you in a few weeks! What a fun post and busy day!! :) Thank you for sharing! I got married in December 2017 and only now getting into a routine that works for me.